The heart is a muscle, and just like any other muscle in your body it can be strengthened through diet and exercise. Without a healthy lifestyle, your heart can become weak and hence more susceptible to danger and illness, so it’s important to eat the right foods and partake in cardio exercises in order to keep it strong for years to come. Below you will find the best foods to eat to keep your heart muscle strong along with exercises to perform for heart health improvement. Generally, sticking to a healthy diet can help strengthen the heart muscle, but what exactly does that mean? Well, for starters, a healthy diet avoids saturated and trans fat, eliminates processed and fast food, and is low in sodium and artificial or added sugars. Alcohol is consumed in moderation or avoided. A heart-healthy diet includes high-fiber foods, lean proteins, fruits and vegetables, monounsaturated fats (olive oil), foods rich in antioxidants, and whole grains. Foods to be included in your heart-healthy diet are blueberries, oats, almonds, yogurt, water, grapefruit, eggs, pineapple, cherries, and pumpkin seeds, to name a few. These foods help provide the body with proper nutrition all the while aiding in reducing other risk factors that can increase the risk of heart problems. This involves better controlling blood pressure and cholesterol, and preventing diabetes as it can lead to heart complications. Along with a nutritious and healthy diet, it’s important to exercise, too. Regular exercise keeps your heart strong. It doesn’t matter when you begin exercising, it will still work to improve heart health. Meaning, even if you haven’t exercised in a while, you can start at any age and still benefit. Although it may be hard to begin an exercise program, once you do start, it will become increasingly easier to complete. Exercise helps improve the heart health in many ways. For example, it helps control blood pressure, reduces cholesterol, keeps your weight in check, and reduces your overall risk of heart disease. Exercise can be as simple as going for walks – or you can try something that is more vigorous, it all depends on your physical abilities. But one thing is for certain: It doesn’t matter what kind of exercise you do, the key is that you move around instead of living a sedentary lifestyle. There are different types of exercises for all abilities, so the real question is, what type of exercise will you choose? 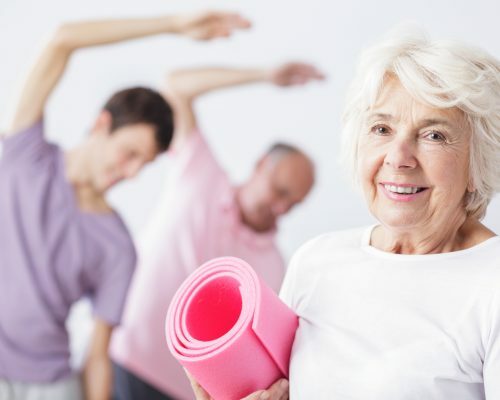 Exercise types include aerobic exercises (these are exercises that increase your heart rate and make you breathe harder), stretching exercises, and strength training. Moderately intense exercise should be completed for at least 30 minutes five times a week. More intense exercises can be conducted less frequently. It’s always important, though, that you gradually work your way up to greater intensity and longer duration. Any type of exercise, regardless of intensity, should always include a warm-up (gradually increasing your heart rate and warming up the muscles to lower the risk of injury) and a cool down. Always speak to your doctor before performing any physical activity, as you may have a condition that limits the range of exercises you can safely perform. Your doctor will be able to recommend the type of exercise that is best for you.